– Positive messages bring lots of smiles to PVMS students Friday morning! 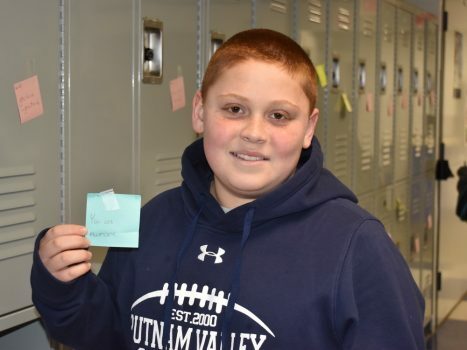 Putnam Valley Central School District > Middle School > Middle School Photo > Positive messages bring lots of smiles to PVMS students Friday morning! Positive messages bring lots of smiles to PVMS students Friday morning! No Name-Calling Week is a week organized by K-12 educators and students to end name-calling and bullying in schools. The week is rooted in the idea of Kindness In Action, not merely recognizing the importance of kindness, but actively adding kindness into our every action. As a way to demonstrate kindness, members of the V.O.I C.E.S. club worked on an activity where all PVMS students wrote positive messages to each other, which the V.O.I.C.E.S members then posted on each students’ locker.